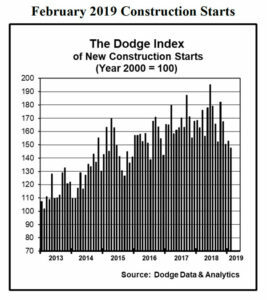 At a seasonally adjusted annual rate of $697.4 billion, new construction starts in February dropped 3 percent from the previous month, according to Dodge Data & Analytics. 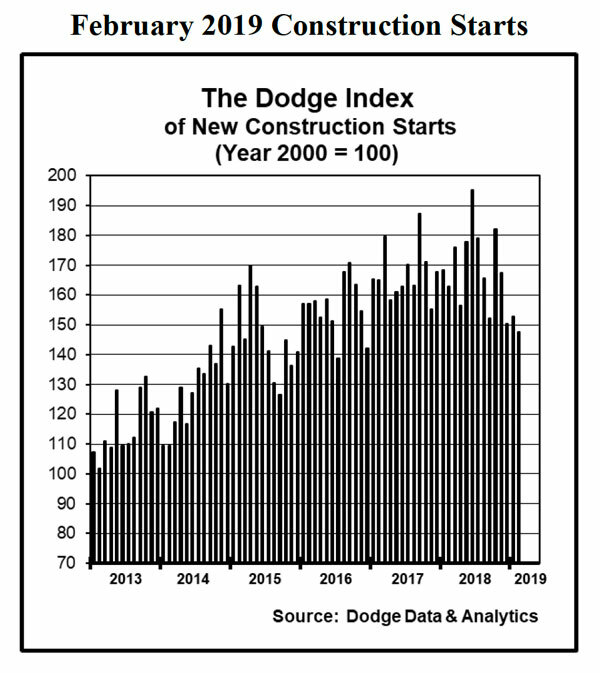 The February decline returned construction starts to the downward path that emerged during the closing months of 2018. Two of the three main construction sectors registered weaker activity in February – nonbuilding construction fell 8 percent, due to a pullback by its public works segment, while residential building slipped 3 percent. Meanwhile, nonresidential building in February was able to hold steady with its January pace. During the first two months of 2019, total construction starts on an unadjusted basis were $99.3 billion, down 12 percent from the same period a year ago which had been lifted by the start of the $2.0 billion NEXUS natural gas pipeline in Ohio and Michigan and the $1.3 billion domed NFL stadium in Las Vegas. On a 12-month moving total basis, total construction starts for the 12 months ending February 2019 were able to remain essentially even with the corresponding amount for the 12 months ending February 2018. Nonbuilding construction in February was $153.6 billion (annual rate), down 8 percent from January. The public works categories as a group dropped 15 percent, retreating for the second month in a row, while the electric utility/gas plant category climbed 34 percent. Highway and bridge construction fell 7 percent after a 2 percent decline in January, and February’s activity was down 12 percent from the average monthly pace during 2018. Large highway projects that reached groundbreaking in February were a $185 million highway expansion in Phoenix and a $178 million highway expansion in San Antonio, Texas. The miscellaneous public works category, which includes such diverse project types as pipelines and rail transit projects, plunged 49 percent in February after soaring 114 percent over the previous two months, with January lifted by the start of the $1.0 billion Midship natural gas pipeline in Oklahoma. By contrast, the largest miscellaneous public works project entered as a February construction start was a $127 million natural gas pipeline in New Jersey. Sewer construction in February retreated 8 percent, despite the start of a $267 million waste water treatment plant expansion in the Honolulu HI area. The remaining two public works project types registered gains in February, with river/harbor development up 25 percent and water supply construction up 11 percent. The 34 percent jump for the electric utility/gas plant category in February reflected the start of two large natural gas-fired power plants, a $1.0 billion plant in Saint Clair, Michigan, and a $937 million plant in Willis, Texas, plus the start of a $375 million solar power plant in the Valdosta, Georgia, area. Residential building in February was $299.3 billion (annual rate), down 3 percent as both sides of the housing market showed decreased activity. Multifamily housing fell 7 percent, retreating after its 17 percent rebound in January. Despite the decline, there were still six multifamily projects valued at $100 million of more that reached groundbreaking in February. These were led by two projects in the Long Island City area of the New York metropolitan area – the $500 million North Tower and the $200 million South Tower at the Hunters Point South apartment complex. The next largest multifamily projects were the $154 million multifamily portion of the $170 million Archer Green mixed-use complex in the Jamaica Queens area of New York and the $144 million multifamily portion of the $240 million Hoffman Town Center project (blocks 4 and 5) in Alexandria, Virginia. The top five metropolitan areas ranked by the dollar amount of multifamily starts in February were – New York, Washington, D.C., Dallas-Ft. Worth, Texas, Miami, and San Francisco. During the first two months of 2019, the New York metropolitan area comprised 18 percent of the multifamily dollar amount for the U.S., up from the 16 percent share for the full year 2018, although not as high as the 24 percent share that was reported for the full year 2015. Single family housing in February receded 2 percent from January, continuing the modest slippage that emerged during last year’s fourth quarter. By geography, single family housing performed as follows in February relative to January – the West, down 5 percent; the South Central, down 2 percent; the South Atlantic, down 1 percent; the Midwest, unchanged; and the Northeast, up 7 percent. Nonresidential building in February was $244.5 billion (annual rate), basically the same as January’s volume. The commercial building categories as a group rose 2 percent, which followed a 4 percent gain in January. Warehouse construction surged 33 percent in February, led by a $200 million Amazon distribution facility in Oak Creek, Wisconsin, an $85 million Costco distribution center in Katy, Texas, and a $70 million Goodyear Tire distribution center in Forney, Texas. Hotel construction climbed 22 percent, reflecting the start of the $372 million hotel portion of the $500 million Circa Resort and Casino in Las Vegas. Store construction improved 11 percent, helped by the start of the $64 million Macy’s Men’s Store redevelopment in San Francisco, and the commercial garage category grew 3 percent. Office construction was the one commercial project type to report a February decline, falling 21 percent after its 18 percent hike in January that featured such projects as the $550 million Reston Gateway office complex in Reston, Virginia, and the $350 million Hines office tower in Houston. Even with the decline, there were still noteworthy office projects that were entered as February starts, such as the $375 million Block 185 redevelopment in Austin, Texas, and the $100 million Cannon House office renovation in Washington, D.C. There were also several large data center projects (included in the office category) that reached groundbreaking in February, led by a $175 million Google data center expansion in Moncks Corner, South Carolina, and two data centers in Ashburn, Virgina, valued at $120 million each. 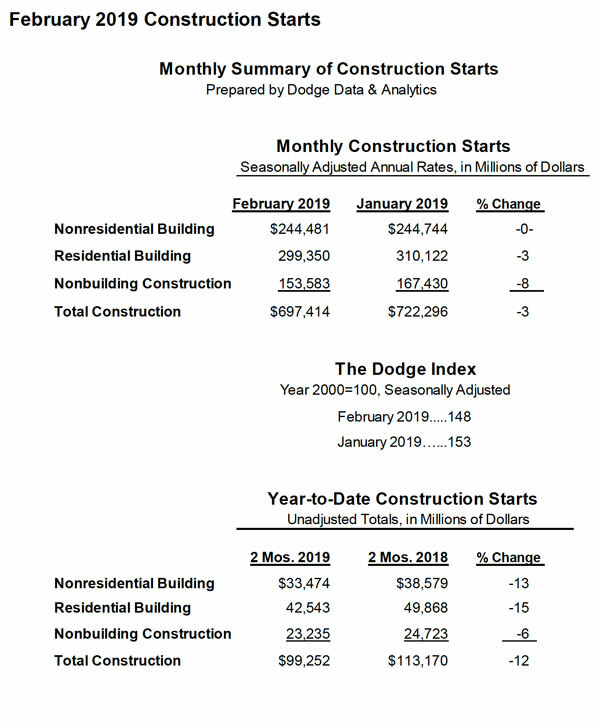 The institutional side of nonresidential building was unchanged in February after the 2 percent decline reported in January. The healthcare facilities category had a strong February, increasing 26 percent with the lift coming from such projects as the $265 million expansion to the Children’s Hospital of Wisconsin in Wauwatosa, Wisconsin, and the $176 million Colorado Center for Personalized Medicine in Aurora, Colorado. Educational facilities in February advanced 6 percent, led by the $200 million renovation of a healthcare research facility at the University of Pittsburgh in Pittsburgh, a $96 million engineering building at the University of Texas in Austin, Texas, plus large high school projects in Millersville, Pennsylvania, ($87 million), Hammond, Indiana, ($78 million), Wentzville, Missouri, ($76 million), and Wimauma FL ($76 million). On the negative side, the public buildings category plunged 45 percent after its 59 percent jump in January that included the $525 million Utah State Prison relocation in Salt Lake City. Decreased construction starts were also reported in February for transportation terminal projects, down 35 percent; church construction, down 23 percent; and amusement-related work, down 7 percent. The manufacturing plant category dropped 14 percent in February after a 13 percent January gain, although the latest month did include the start of a $135 million lumber production facility in Albany GA and a $105 million window manufacturing plant in Goodyear, Arizona. The 12 percent shortfall for total construction starts on an unadjusted basis during the first two months of 2019 compared to last year was the result of lower activity for each of the three main sectors. Residential building fell 15 percent year-to-date, with single family housing down 13 percent and multifamily housing down 17 percent. Nonresidential building dropped 13 percent year-to-date, with commercial building down 5 percent, institutional building down 18 percent, and manufacturing building down 29 percent. Nonbuilding construction retreated 6 percent year-to-date, as a 17 percent decline for public works was partially offset by a 116 percent surge for the electric utility/gas plant category after a very weak first two months of 2018. By geography, total construction starts for the first two months of 2019 versus the same period a year ago performed as follows – the Midwest, down 24 percent; the Northeast, down 15 percent; the South Central, down 10 percent; the South Atlantic, down 9 percent; and the West, down 8 percent. Additional insight is provided by looking at 12-month moving totals, in this case the 12 months ending February 2019 versus the twelve months ending February 2018, which offers less volatility than is present with year-to-date comparisons of just two months. On this basis, total construction starts for the most recent twelve months essentially matched the amount of the previous period. By major sector, residential building grew 2 percent, with 2 percent gains for both single family and multifamily housing. Nonresidential building was unchanged from the previous period, with manufacturing building up 21 percent, commercial building up 2 percent, and institutional building down 5 percent. Nonbuilding construction dropped 4 percent, with public works down 2 percent and electric utilities/gas plants down 16 percent. By geography, total construction starts showed this pattern for the most recent twelve months compared to the previous period – the South Central, up 9 percent; the West, up 3 percent; the Midwest and South Atlantic, each unchanged; and the Northeast, down 15 percent.